A great cause reminds me of what truly matters in the world and all that I have to be grateful for. A great cause helps me pause in the middle of my life routine and busy work day to regain a global perspective. I named my business “Global Alignment” to remind my team and myself how we can positively impact the world by aligning in our sameness instead of separating in our differences. Can we remember to replace “I” with “We” in a global way? Beyond our global coaching, we sometimes forget to challenge ourselves to find ways to directly PARTICIPATE in global issues. 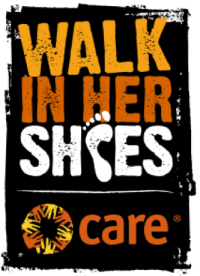 Our team at Global Alignment is very proud to support the “WALK IN HER SHOES” C.A.R.E. project. It helps women and girls gain confidence and play a new and important role in their community. With help, they are being empowered to have choice, use their voice, defend dignity and find new ways to rise up against poverty and lift up their families and communities. Founded in 1945, CARE is a leading international humanitarian organization fighting global poverty. In over 80 countries, CARE works with the poorest of communities. They improve basic health and education, to access to clean water and food and expand economic opportunity. To the Global Alignment clients, friends and associates that will “Walk In Her Shoes” we thank you and support you. For everyone else, please see take a moment to learn more about this amazing Walk and the CARE organization. Like anything in life, little steps can have great impact! We encourage you to find what you CARE about (locally or globally) and participate in any way that feels right for you! If you have a great organization, charity or cause that you support, we would like to know more about it. PLEASE post that information to our Global Alignment Facebook page. We are always interested in learning about ways to support great causes and groups!